Inflatable boat racing was founded by a South African native– Deon– who came to the United States over 10 years ago. He was so inspired by the reaction of his new American family when they attended the Trans Aghulas race in Plettenberg Bay that he aspired to bring this same fun and excitement to the people of America. The sport of inflatable boat racing has been around for over twenty years and has recently spread to other countries from South Africa. IBR has the distribution rights with the best boat manufacturers in the industry. These companies have been around since the sport started and they continue to be top-notch reputable manufacturers that IBR can trust. Between the two manufacturers, they have dominated international boat races. Inflatable Boat Racing is your one-stop-shop for all the sport’s necessities. 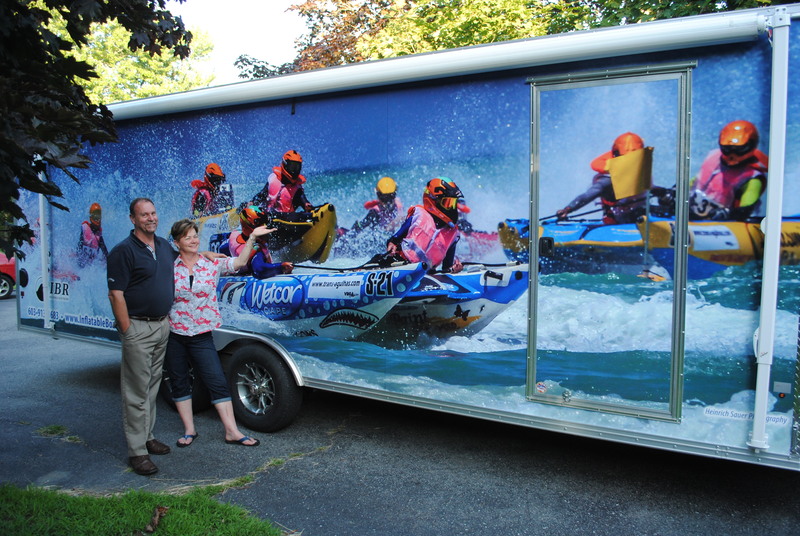 Maria and Deon (Owners and Founders of IBR) with the new trailer! Great picture, and you have an awesome company and website. Enjoyed talking with you about these great boats and racing,this is going to be big in the US.We love racing and fast boats and cars so this will go over very well.Look forward to talking more about your boats Jim in Tennessee. hi. i have recently bought a 2016 aquarius thundercat. wondering if you had any advise regarding wjat pressures to run. I’m interested in your boats and like to know which model is used for long distance racing? Also fuel economy.